BlackBerry Curve 3G heading to Sprint | BlackBerry Blast! 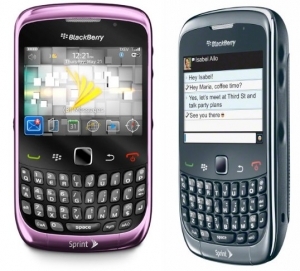 A day after Verizon announced they would offer the BlackBerry Curve 3G, RIM and Sprint have made a similar announcement. BlackBerry Curve 3G will be available beginning Sunday, Sept. 26, through Sprint's direct ship sales channels including Business Sales, Telesales (1-800-SPRINT1) and Web sales (www.sprint.com) for $49.99 with a new two-year service agreement, after a $100 mail-in rebate (taxes and surcharges excluded). It will then be available in all remaining Sprint sales channels beginning Sunday, Oct. 10. "The new BlackBerry Curve 3G is an extremely attractive, approachable and affordable handset that provides a perfect choice for Sprint customers who are looking for a user-friendly 3G smartphone to help them make the most of their day," said David J. Smith, vice president of Product Management, Research In Motion. The BlackBerry Curve 3G smartphone will support a variety of multimedia applications, including Sprint Music Store(TM), Sprint TV(TM) and Pandora(TM). It also boasts dedicated applications for a smoothly integrated social networking experience with Facebook(R), MySpace(TM) and Flickr(TM). BlackBerry Curve 3G requires activation on an Everything Data plan or a Business Advantage Messaging and Data plan. Additional plan options are available for business customers. Sprint's industry-leading Everything Data plans with Any Mobile, Anytime(SM) include unlimited Web, texting and calling to and from every mobile in America while on the Sprint network. Everything Data plans start at $69.99 per month - the same price Verizon and AT&T charge for unlimited talk only (all price plans exclude surcharges and taxes).